Beers and Babies is a new parents group for caregivers in Portland, OR. Join your community as we gather for a casual afternoon of beer-drinking and baby-admiring with a different kind of Portland beer group. Share your joys, your struggles, and a pint with people who also care for young ones. We're not your mom's new mom's group - we're an inclusive group for parents in Portland who like beer, who like babies of all ages, and who need to get out! Find us on Facebook! and now on Instagram too! Beers + Babies are casual, inclusive, all-ages events for the whole family. We usually meet for about an hour, or as long as our kids let us! Typically people stay no more than two hours. Kids' ages typically range from newborn to preschool, but we are friendly to all ages. FREE, just buy your own beer and snacks. Only our Special Events sometimes have minimal fees to cover expenses (like art supplies for Family Craft Night events). Bring your baby, baby carrier, partner(s), friend(s), siblings, older children, etc. There are no age requirements - all are welcome. Sunday, April 14th from 4-5 pm: The Vancouver area event typically occurs on the 2nd Sunday of the month. This month we return to Trap Door Brewing, one of our favorite spots! Friday, April 19th from 4-5pm: On 3rd Fridays we collaborate with Portland Area Babywearing for an event at The Oregon Public House, with a small selection of carriers available to try on and babywearing help available. Sunday, April 28th from 4-5pm: We always meet the "Last Sunday" of the month, and we try to go to a new place each month. It's like really slow bar hopping! In April we'll stopping by the Baerlic Barley Pod on NE Halsey - bring your picnic blankets and plan for a beautiful day outside! 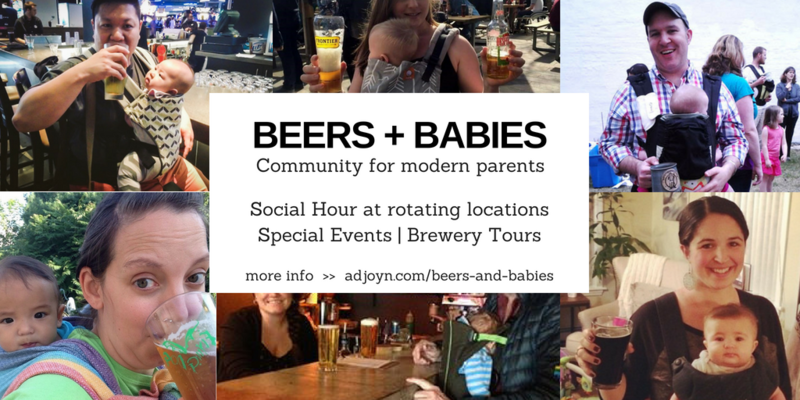 Details for all our events are also listed in the Beers and Babies Facebook Group or via our email list, and you can find us on PDX Kids Calendar and Eventbrite. Need some babywearing or car seat help? See our Services page for everything we offer. Each month we visit a different brewery in Portland on the Last Sunday of the month (and sometimes on the 2nd Sunday of the month in Vancouver too!). Here is a list of everywhere we have been so far, with some photos posted in slideshows below! May 2018 Last Sunday - Our 8th meeting on the last Sunday of the month was one of our best yet, with many returning families passing down their parenting wisdom to a handful of new folks! We are grateful to Base Camp Brewery Company for having us! April 2018 - We packed Ecliptic Brewing with so many babies! We were happy to see lots of new families mixed in with some familiar faces. Big thanks to Ecliptic for accommodating so many of us!! March 2018 - Lots of babies at Level Beer in NE. This was a great spot on a lovely spring afternoon! We had a wonderful mix of young babies and toddlers. Thanks to everyone who made the journey out to 148th! February 2018 - Thanks to everyone for coming out on a rainy and cold February afternoon! We had over 10 families packed in Sellwood's tiny Laurelwood Public House! It was great to get out after a snowy week indoors. We can't wait until next month! January 2018 - Our biggest group yet came out to Fat Head's in NW! It was wonderful to meet so many new Beers + Babies people. Our group is best when we're a mix of regulars and first-time attendees! December 2017 - Thanks to everyone who helped us celebrate an early New Years Eve!! We had a great time at Zioglhaus Brewing - they have a perfect play area for kids! October 2017 - We gathered at Lucky Labrador Brewing in Southeast Portland for our first event. We had a great group of toddlers getting their energy out! Thanks to Lucky Lab for hosting us for the hour!